The radar antenna on the right is the TTR [Target Tracking Radar]and the one closest to you on the left is the MTR [Missile Tracking Radar]. As you see the radar vans are in line, one on each end of the maint bldg. BC[Battery Control] van on right (nearACQ)[Acquisition radar] and RC [Radar Control]van on left. The generator building is the square building on the parking area. The cars you see belong to people on my crew. The MG belonged to a Crew Chief and the Ford conv belonged to another Mechanic. The Sedan in front of the vans belonged to a visiting inspection team. 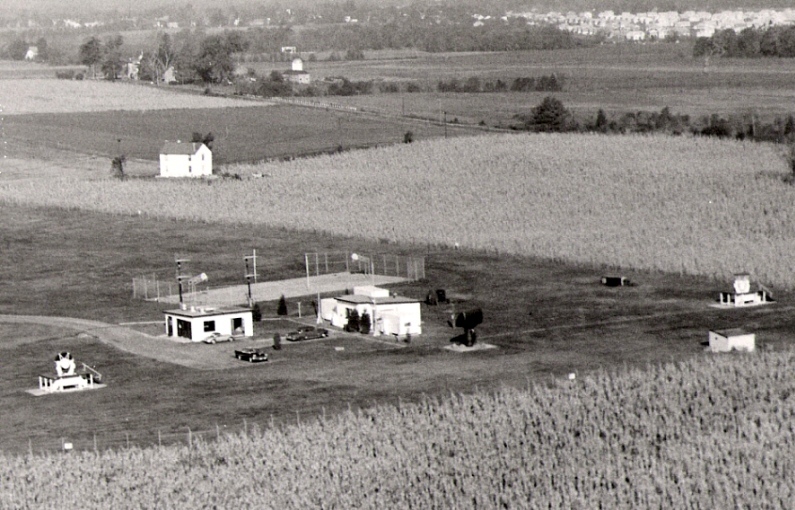 The two black poles behind the Generator building were the VHF Radio Antennae for interarea communications in case the interarea cables were cut or other wise out of action. There were two other antenna in the Launcher Area. There is another room (part of the cinder block portion) on the far side of the maint corridor) and not readily visible in this photo. This was the FUIF (Fire Unit Integration Facility) Room and contained equipment that provided symbols and data which was sent from 52d Brigade (Atlantic Highlands, NJ) the operational Hqs for the Phila Defense. This information could electronically designate target aircraft and other identification symbols on the PPI (scope) of all sites in the Defense. In this manner they could control the tracking/firing operations of the various units to prevent duplication of effort in case of attack.